Is my project exempt from IACUC oversight? Antibody Production or other Animal-Derived Materials: Acquisition of commercially-available materials such as antibodies that are considered “off-the-shelf,” i.e., for which the products are available to non-UofL Principal Investigators (PIs), are exempt from IACUC oversight. Studies requiring the production of “custom antibodies” are NOT exempt; a Proposal must be completed for such studies that, in particular, highlights the antibody producer in the “Collaborating Institutions” section. The IACUC has also approved a “Proposal to Use Animals in Research and Teaching at Collaborating Institution(s) Only” form which may be applicable. Field Studies: Studies limited to observation of free-living wild animals in their natural habitat are exempt from IACUC oversight. Studies that involve capture, an invasive procedure, harms, or materially alters of influences the behavior or activities of an animal under study are NOT exempt; a Proposal must be completed for such studies. Privately-Owned Animals. Studies limited to observation of privately-owned animals without handling or manipulation in any way are exempt from IACUC oversight. Studies that involve animal handling, collection of tissue samples, or materially influences the behavior or activites of an animal under study are NOT exempt; a Proposal must be completed for such studies that, in particular, highlights the antibody producer in the “Use of Privately-Owned Animals” section. Eggs. The use of unfertilized avian (e.g., chicken) eggs is exempt from IACUC oversight. The use of fertilized avian (e.g., chicken) eggs is NOT exempt from IACUC Oversight. Studies using avian eggs must be described in a “Use of Chicken-Avian Embryos” form. Tissues. Use of tissues that are acquired from vertebrate animals not originating from a Principal Investigator’s approved Proposal to Use Animals in Research and Teaching (Animal Proposal), such as from other laboratories or abattoirs, requires an approved Proposal to Use Fresh or Frozen Tissue in Research and Teaching (Tissue Proposal). PI’s with current IACUC-approval for a given species, however, are exempt from this requirement. Invertebrates. The use of most invertebrate species does not require submission of the Proposal for IACUC review and approval. However, the IACUC recognizes that the general principles and ethical considerations described in the Guide for the Care and Use of Laboratory Animals (8th Edition, 2011) are applicable to these species, including the concepts of the “3-R’s” – replacement, reduction, and refinement; and expects Principal Investigators to carefully consider the use of any animal species and to weigh the significance of study goals against any potential pain and/or distress that may be imposed on animals. Use of cephalopods is NOT exempt; a Proposal must be completed for studies using these species. Must there be a one-to-one relationship between IACUC Proposal and grant/contract application/award? No. It may be perfectly reasonable to include the studies of several related grants in a single "master" IACUC Proposal. There are also examples of individual Proposals, such as for breeding colony maintenance, that are associated with several experimental Proposals, each of which may be linked to other grants; therefore more than one Proposal with a single grant award. While the committee is happy to provide advice, we generally leave that decision with the PI. I will be submitting a grant and the proposed use of animals involves procedures for which I already have IACUC approval. Could I consider/attest that I have IACUC approval for the proposed grant application? If the studies (not just procedures) you have described in the grant application are the same as in your approved protocol, then you are approved. If there are differences in the grant application and what is described in your approval IACUC, then you are not (yet) IACUC approved, and you should state "approval pending" if that is an acceptable option for the granting agency. This is true for the rationale, animal numbers, etc., and not solely for the procedures that will be performed. How do I modify or revise my approved Proposal? All requests to modify a Proposal must be submitted through iRIS. Please visit the Protocol Management section of the website for detailed information on how to modify a Proposal. NOTE: To add personnel, there is a separate iRIS form in iRIS. Personnel changes should not be done via the modification form. How much detail do I need to provide when I describe Experimental Groups? A crucial aspect of IACUC oversight is appreciating not just the procedures planned, but the justification, rationale, and purpose of the proposed use of animals. The committee must understand what will happen to each individual animal, when, and why. In the Technical Summary, you will provide a brief description of the overall goals of the study and how the experimental groups will help address the specific aims. In the Experimental Groups section, you must outline all experimental groups, the procedures that will be performed on each group, and the rationale for each set of procedures. Timelines will assist the reviewer in recognizing individual animal disposition and discerning when in the course of the experiment procedures will occur (this is especially important for projects employing multiple survival surgery or other repeat procedures). Take-home-message: the clearer the description, the easier the review. Can I include several methods that may or may not be used in experimental groups? Yes and no. Yes, it is certainly appropriate to describe, for example, two different methods of euthanasia that may be used in different experimental groups. It is also likely acceptable to state that one of several methods may be employed for the same outcome (for example, modes of anesthesia, euthanasia, different post-procedural analgesia) as long as the IACUC understands the rationale behind the various means. It might even be appropriate to describe invasive procedures that may or may not be employed. This becomes a bit stickier; however, because the use of such procedures may increase the potential for distress. As long as the committee is cognizant of what will (even potentially) occur, then approval is likely. It would not be appropriate to simply provide a laundry list of potential procedures. Again, the IACUC must not only be aware of what will happen to experimental animals, but why. The IACUC Proposals must describe and justify the experiments themselves so that the Committee will be able to reasonably agree that the designed experiments will produce useful data. An incomplete, poorly planned, or open-ended study should not be approved. What is expected when justifying animal numbers? As long as the Experimental Groups are described well, justifying animal numbers is relatively simple. You need only to provide the specific rationale for the selected number of animals per group (n). Statistical calculation given a known or expected error rate and difference between groups (i.e., power analysis) is preferred, but extensive experience with the specific model may be accepted. Rarely, if ever, is a number based on a timeline deemed sufficient justification (e.g., “we hope to analyze one sample per month – this requires 3 animals/month, or 36 animals per year, equating to 108 – let’s make that 110 – animals/year”). Such an open-ended justification is based on practical issues rather than the scientific aims of a well-organized and designed project. Agreement between the numbers displayed in the table and those in the narrative is also beneficial! Is there a maximum number of animals that will be approved by the IACUC? No. The number of animals needed is driven by the goals of the experiments. The use of each animal should be accounted in the Proposal; for some studies, this may be a very large number. In fact, it is just as likely that the committee will question a small number of animals - it would be wasteful to attempt an experiment and not produce enough data for meaningful analysis. Is it acceptable to include "extra" animals? Training. A few animals (remember to justify why you chose that number) are often required for you and your staff to learn or finalize a new procedure. In fact, the IACUC may insist on performing at least terminal (non-survival) procedures on a few to maximize the potential for success in experimental animals. Anticipated adverse events. It is usually not considered acceptable to "pad" the numbers just-in-case, i.e., for unexpected events. In these cases, a modification to add back numbers of animals that succumbed to a watering mishap, identification error, or some such will be readily reviewed and approved. However, it is reasonable to predict some animal loss, either from mortality or otherwise rendered "unusable," for some procedures or models. In these cases, an estimate of loss can be used to justify additional animals - remember to include a description of how such loss will be minimized. How do I complete the section discussing “alternatives”? Two questions in the Proposal form recommend that PIs use literature database searches, although the goals of the two searches are significantly different. In one section, which pertains to all Proposals, PIs are asked to describe the methods used to verify that the proposed activities do not unnecessarily duplicate previous experiments (from Russell and Birch’s “3 R’s”: reduction, replacement, and refinement). 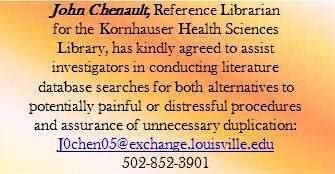 The other, which is often more difficult to conceptualize, pertains only to those projects that involve more than momentary pain and distress (UofL IACUC Category 2 and 3 procedures). This section requires the PI to provide a narrative description of the methods and sources used to determine that inducing the pain/distress in question is necessary and that there are no suitable alternative (less painful or distressful) models. According to the USDA’s Animal Welfare Information Center (AWIC), an alternative is any procedure which results in the reduction in the numbers of animals used, refinement of techniques to minimize pain/distress, or replacement of animals. The narrative should consider alternative approaches to address of all three of these concepts. The IACUC recognizes that considerable thought and planning precludes a PI’s decision to employ animal models, from ethical, practical, and financial perspectives. The necessity of animal use and the procedures employed for many projects is somewhat intuitive; nonetheless, federal regulations require a written description justifying the model and outlining how the PI determined that alternatives are not available. A first step in considering alternatives is to identify all of the procedures involved in the project for which it is reasonable to presume are associated with potential pain and distress. For surgical models, this includes the surgical approach itself (e.g., thoracotomy), not just the surgical procedure (e.g., coronary artery ligation). For both consideration of alternatives and assurance of non-duplication, most PI’s wisely use literature databases in their “good faith review of available sources.” The USDA advises the use of at least two different databases, e.g., MEDLINE, AGRICOLA, CAB Abstracts, ToxFile, EMBASE, BIOSIS, Zoological Record, Life Sciences, PSYCHINFO, ASFA, Current Contents, SciSearch, Index Medicus, and Current Research Information Services (CRIS). The AWIC (http://www.nal.usda.gov/awic), through the National Agricultural Library and National Library of Medicine, offers assistance with literature reviews. AWIC also publishes bibliographies, information resource guides, bulletins, and fact sheets that address alternatives. What are the different types of survival surgical procedures? Major Survival Surgery - Any surgical intervention that penetrates and exposes a body cavity; any procedure that has the potential for inducing permanent physical or physiologic impairment; and/or any procedure associated with orthopedics or extensive tissue dissection or transection. Minor Survival Surgery - Any surgical intervention that does not expose a body cavity and causes little or no physical impairment. Examples include laparoscopy; wound suturing; peripheral vessel cannulation; percutaneous biopsy; routine farm-animal procedures such as dehorning, castration; prolapse repair; and most procedures done on an “outpatient” basis in veterinary clinical practice. What training/information is needed for Project Participants? As stated in the Guide for the Care and Use of Laboratory Animals, a fundamental IACUC responsibility is ensuring that personnel performing animal-related procedures are adequately skilled. Training requirements are summarized and can be accessed via the IACUC Policy entitled, "Required Training"
Euthanasia training is required of any personnel (new personnel or new proposal submissions) responsible for euthanasia. Level III Training is optional, but provides more in-depth species and procedure specific training. For the IACUC to meaningfully review training and/or experience, PI’s must complete the Project Participants section in the Proposal form that defines a participant’s “role" in the study. All expected duties should be outlined, e.g., observation, handling, anesthesia, test article administration, post-procedural monitoring, and euthanasia. If an individual has little or no relevant experience, the PI should describe how, and by whom, the individual will receive appropriate oversight and training. How do I add/remove Project Personnel? In order to add/remove personnel from an approved project, please complete the form within iRIS. Instructions for how to do this can be found HERE.